Justin Herbert played just one half. Dillon Mitchell finished with one catch for nine yards. Oregon completed just one pass in the second half. Given those facts, one would assume the 122nd Civil War was a complete disaster for the Ducks. Oregon dominated the line of scrimmage on both sides of the ball and rushed for 392 yards as the Ducks manhandled Oregon State 55-15. The Ducks finished the regular season 8-4 and 5-4 in conference. The eight wins are their highest since 2013. The Beavers’ season ended with a 2-10 record and a thud. Oregon’s bowl destination is not known yet and the Ducks may not know until after the Pac-12 title game next week. While Oregon was running up and down the field, the Duck defense held Beaver tailback Jermar Jefferson to just 64 yards. The freshman came into the game second in the conference in rushing, averaging nearly 120 yards per game. But the Ducks made sure that if they were to be beat, Jefferson wasn’t going to be the one that does it. Jim Leavitt’s game plan was to see if OSU quarterback Jake Luton could have enough success to defeat them. Luton did have his moments, throwing for 287 yards and two touchdowns, but he was also picked off two times. One of those interceptions went for six points the other way. Thomas Graham, Jr. was the recipient of the Pick-6 when he jumped a route and went 38 yards to pay dirt. That defensive score at the beginning of the fourth quarter made it 41-9 Ducks and the game was well in hand. It was quite evident early on that it was going to be a very long day for the Beaver defensive line. The Ducks scored a touchdown on their first possession with a six-play, 67-yard drive. Five of those plays were runs for chunks of yardage for Travis Dye and CJ Verdell, who ended the drive with a 21-yard touchdown on a screen pass. That touchdown to make it 7-0 just four minutes into the game was Verdell’s first of five scores on the day. He finished his first Civil War experience with 187 yards and fourth other touchdowns on the ground. Verdell didn’t even lead Oregon in rushing. Not to be outdone, Dye’s initial rivalry game was also a nightmare for the Beavers. The true freshman finished the game with 199 yards and two touchdowns. Both teams exchanged possessions and when Oregon got the ball with 4:02 left in the first quarter on their own 44, the Ducks went to work. Verdell gained 17 yards on the first play of the drive and then punched it in six plays later to make it 14-0 with 2:06 left in the first quarter. Oregon State was finally making its way down the field thanks to a couple of 15-yard defensive penalties. Eventually, the Oregon defense forced a 40-yard Jordan Choukair field goal attempt that went wide left. It was a tough game for the junior kicker who also missed an extra point. 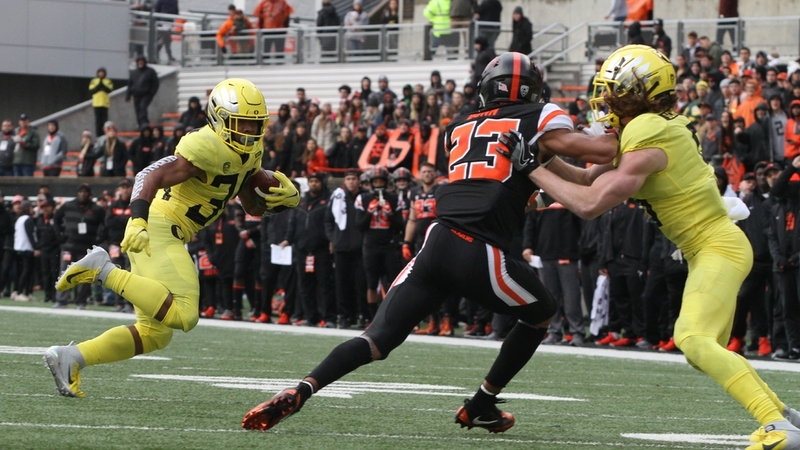 The Ducks took over on the 22-yard line and took just three minutes to go 78 yards for their third touchdown, another Verdell 1-yard plunge to make it 21-0. The crowd of an announced attendance of 39,776 finally had something to cheer about when the Beavers ran a reverse on the ensuing kickoff return to the Oregon 46. They kept on cheering as the Beavers made their way to the Duck 3-yard line. And just when it looked like Oregon State was going to crack the scoreboard, coach Jonathan Smith thought it was time for another trick play. He brought in backup quarterback Jack Colletto for a fake run and a jump pass. But Oregon must have scouting this particular play because Troy Dye tipped the pass and Nick Pickett snatched it out of the air for the interception. Oregon’s next drive stalled with a sack on the 36-yard line with four minutes left until halftime, but this was when Herbert was hurt and wouldn’t play the rest of the game. The Beavers did manage to break through with Choukair’s 45-yard field goal, but the home team found themselves down 21-3 at the halftime break. Despite being dominated in the first 30 minutes, one could say that the Beavers were still in the game and the Ducks were going to have to play the second half without Herbert. Even with that adversity staring them in the face, the Duck offense didn’t blink. “A year ago, when we didn’t have him (Herbert), we fell apart. But this time, we rose to the occasion,” Cristobal said. Braxton Burmeister took the snaps in the second half, but the sophomore signal caller didn’t have to do much. He just needed to hand the ball to Verdell and Dye over and over again. Dye scored his first touchdown from 15 yards out with 9:33 on the clock to make it 28-3. The big play came on a third-and-two from midfield and Verdell broke through the line to run 33 yards. Oregon State finally scored a touchdown when Luton completed three big passes, the last completion being a 22-yard score to Tim Hernandez. The senior receiver barely had his foot in and after review, it was confirmed. Unfortunately for the Beavers, Choukair shanked the extra point and it was 28-9. Choukair had a bad game, but Hernandez did not. He finished his career with a great game, six catches for 87 yards and two touchdowns. Fellow receiver, Isaiah Hodgins had an even better day with eight catches for 133 yards. But those two wide outs couldn’t carry the Beaver offense on their own. They needed help from Jefferson and maybe a tight end, but that help never came. Oregon made it 34-9 with a drive that was set up with a forced fumble on another trick play that backfired. Oregon State tried a double reverse that the Ducks were more than ready for. Luton was crushed, dropped the ball and lineman Gus Cumberlander pounced on it. Just 23 yards away from the end zone, Oregon wasted no time. Verdell broke through the line on a fourth-and-one to go 14 yards and the touchdown. With the rain and wind howling at the time, Cristobal decided to go for two, but it failed. That was the only thing that would fail for the Ducks on this day. After Graham’s Pick-6, Oregon scored two more times on Dye’s 39-yard touchdown to make it 48-9 and Verdell’s third one-yard plunge to complete the Ducks’ scoring. Hernandez’s 31-yard touchdown reception with 16 seconds left accounted for the final score.